There’s still time to book your 2019 Camping Reservations for our Holly Shores Seasonal Sites. Make your reservation today so you can take advantage of a full year of fun campground amenities and events at Holly Shores Resort! Make us your home away from home getaway destination near Wildwood and Cape May, New Jersey! There are plenty of local events to keep you busy this spring, summer and fall in 2019. How Does Seasonal Camping Work? Holly Shores 2019 Seasonal Camping Rates runs from April 15th to October 31st, 2019. 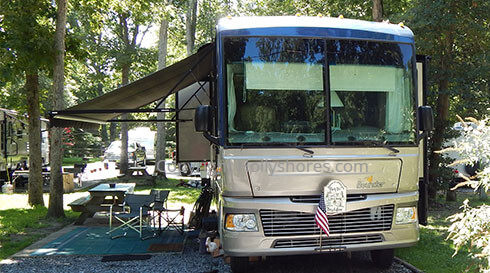 Pay a flat rate to guarantee your special RV campsite for whenever you need a Cape May getaway! Your 2019 camping reservation includes 20/30/50 Amp metered electric service, water, free cable TV and free WiFi and full access to campground events and amenities. 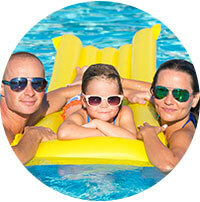 Seasonal rates apply for a family of two adults and two children (unmarried and under 18 years of age), or two grandchildren (unmarried and under 18 years of age). Have more campers in your party? No problem! Additional persons are $125 each for the season or $70 for children 12 and under. Holly Shores Camping Resort is pet friendly! We even have a large fenced in dog park. One dog or cat is included in our seasonal price. Additional pets are $100 each for the season. Maximum two pets. RVs in our seasonal site cannot be more than three years old, and are required to include a deck and skirting. If that isn’t an option for you, that’s OK! Seasonal Sunpass stays are available for RVers without a deck or skirting. Reserve your spot for 2019 camping reservations at Holly Shores Resort today! For rates and additional information on Seasonal Camping at Holly Shores, Contact Us or call our resort office at 877-494-6559. Make 2019 your year full of family fun!